For the early arrivals among the approximately 300 attendees, convention chairwoman Marsha Hunter and her team arranged tours of local attractions, including Margaret Mitchell’s home and Stone Mountain Park, as well as a special Wednesday evening MADC Peach Festival and Pageant. Attendees at this break-out event received an 8-inch Maggie-face “Georgia, Little Miss MADC” while a 10-inch “Miss Georgia Beauty Queen” reigned over the table centerpieces. Thursday morning, conventioneers gathered for the Welcome Breakfast. 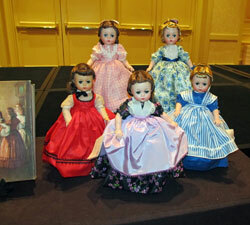 An 8-inch Caroline doll, inspired by a 15-inch version first issued in 1961, was the table centerpiece doll. 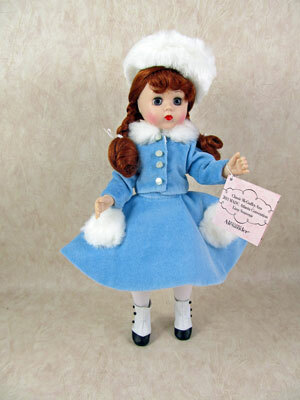 An 8-inch brunette “Blue Party Dress,” wearing an outfit inspired by an early 1960s release, was the souvenir doll. 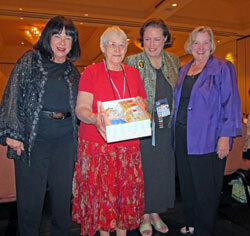 The convention team received “Southern Azalea” dolls to reward their hard work. Placques were presented to this year’s Who’s Who award winners: Caroline DesRochers, Mary Ann Duffield, Annette Palombella, Patrice Perkins and Tonya Rice-Turner, then Margaret Winson announced the 20-Plus group’s Hart Award recipient, Ann McCurdy. After breakfast, the board of directors conducted the club’s annual business meeting, followed by events for newcomers, children, and teens along with two workshops; the opening of the sales, raffle and hospitality rooms; a presentation by the Alexander Doll Company; and the opening of the special display and the Design Contest exhibit. 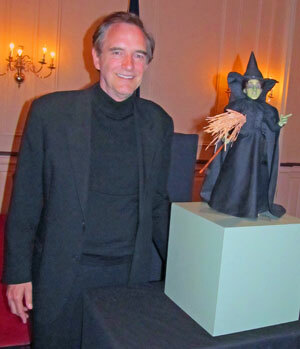 The break-out Cissy Dinner that evening had a “Gone With The Wind” theme. 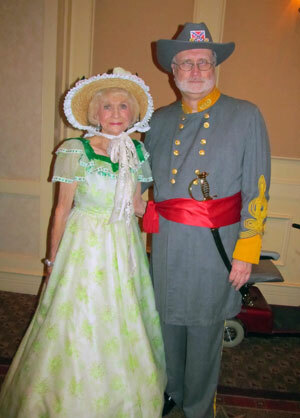 21-inch “Confederate Soldier, Ashley,” guarded each table, and “Scarlett O’Hara Saratoga Cissy” was the souvenir. Scarlett’s gown, a Walter Plunkett design, did not appear in the movie and had never before been produced by the Alexander Doll Company. Friday morning’s All-in-a-Row breakfast was a breakout event for guests who have attended five or more conventions consecutively and focused on Madame Alexander’s cloth creations. Paying homage to children’s author Joel Chandler Harris, a plush Brer Rabbit and an 8-inch Joel served as the centerpiece, with attendees receiving an 8-inch Chandler souvenir. The ticketed Travel Doll Luncheon took attendees back to the 1996 Atlanta Olympics and the first USA gymnastics team to win gold at a fully attended Olympics. An 8-inch USA Gymnast was the event souvenir and a girl and boy pair dressed in red, white, and blue was the centerpiece. More workshops and other activities occupied attendees both Friday and Saturday. The breakout Cissette Dinner’s theme was Steel Magnolias, Strong Women of the South. The event souvenir, a 10-inch Southern Bride, was inspired by Julia Roberts, a Georgia gal. And no wedding would be complete without the Mother of the Bride that presided over the tables as the centerpiece. 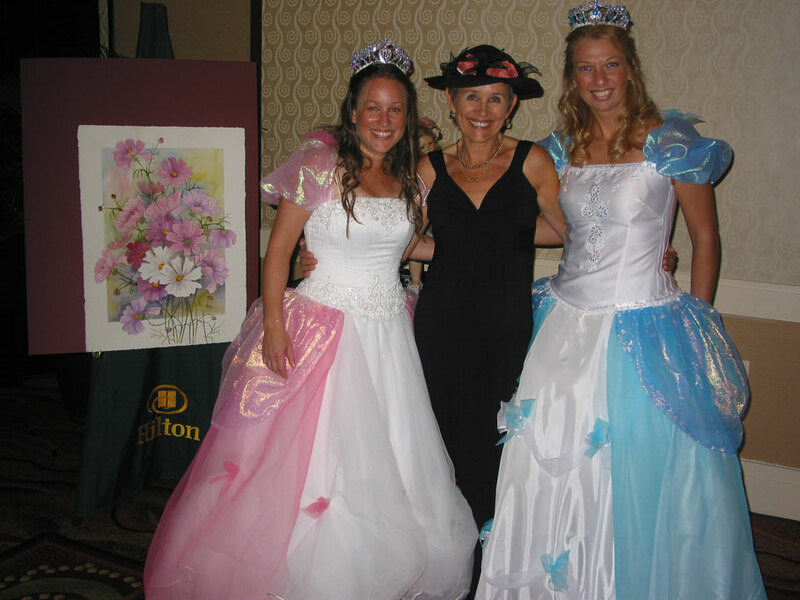 Conventioneers who have been club members for more than 20 years were honored at Saturday’s 20+ Breakfast, where the centerpiece was “Golden Memories Lissy” wearing a vintage-inspired gown. The event souvenir was an 8-inch “Glamour Girl Picnic Day” adapted from an 18-inch version produced in the mid 1950s. Lissy was the star of her own ticketed event, the “Lissy Through the Bookcase” luncheon. 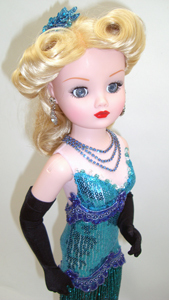 The centerpiece doll, “Lissy Southern Belle,” wore a Scarlett-type gown and the souvenir was “Classic Lissy McGuffey Ana,” inspired by the 1963 model. The final event was the Golden Jubilee Banquet, which opened with the traditional Living Doll Parade, where young collectors dressed as their favorite dolls entered the room as a group. The tables featured an elegant “Golden Jubilee Cissy” as the centerpiece. The Service Award, the highest honor given to a member of the MADC, was presented to Georgia Shields for her outstanding contributions to the club. There was a lively auction for a OOAK “Cissy Scarlett” and, as the evening drew to a close, the convention souvenir doll was distributed — an 8-inch Wendy named “Blessings from Margaret,” the closing associated with Margaret Winson’s correspondence to club members. The 30th MADC convention is scheduled for June 20-23, 2012, in Albuquerque, N.M.. For more information about the Madame Alexander Doll Club and next year’s convention, visit www.madc.org or call the club office at (212) 368-1047.